Some of you know that I've been down with the flu for several days but, for the rest of you, let me start by sending apologies to all the favorite blogs which I follow because I haven't been around to visit or comment and, truthfully, there are so many posts, I'll never catch up on the commenting. My plan is to visit and absorb but I may not be able to leave individual comments. I managed to get this card done for posting and today is the first day I've felt up to spending any amount of time at the computer, at least enough to check email and write up a post. I did this card for a birthday. I colored that darling fairy image (A Day for Daisies) with ProMarkers and cut it and the other two mats with dies from QuicKutz. I used scraps of dp for the pink and blue mats. The purple striped dp was also a scrap but it was just the perfect size for an A2 card. I wrapped the card front with sheer ribbon from Really Reasonable Ribbon and added a rose and rose bud. The purple leaves were cut with my favorite Cheery Lynn die. Finally, I printed the sentiment and cut it with a QuicKutz die, then added it to the card front. This is gorgeous Connie, don't worry about commenting just make sure you are well. Take care. 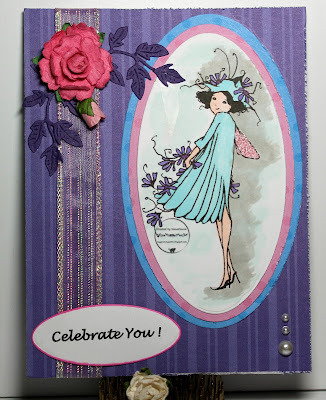 Love your pretty card. It's framed out perfect and the addition of that flower is beautiful! I hope you are feeling better by the hour Connie. This is a lovely card, so feminine. I know what you mean about catching up, it's a nightmare isn't it? after a couple of days even. Take care. I am sorry you aren't feeling well! I sure hope you get back to feeling better real soon. I love the image on your card, such a pretty Fairy!